We welcome all I AM members, family, and friends to attend this general meeting. We will begin at 12:30 with a brief description of our planned activities. It will be a good opportunity for members to offer feedback, suggestions or items of interest. Pizza and snacks will be provided. Following the general meeting, the Lehigh Valley Center for Independent Living will be providing a brief and informative seminar on the Americans with Disabilities Act with specific focus on how it relates to state and local government and businesses. 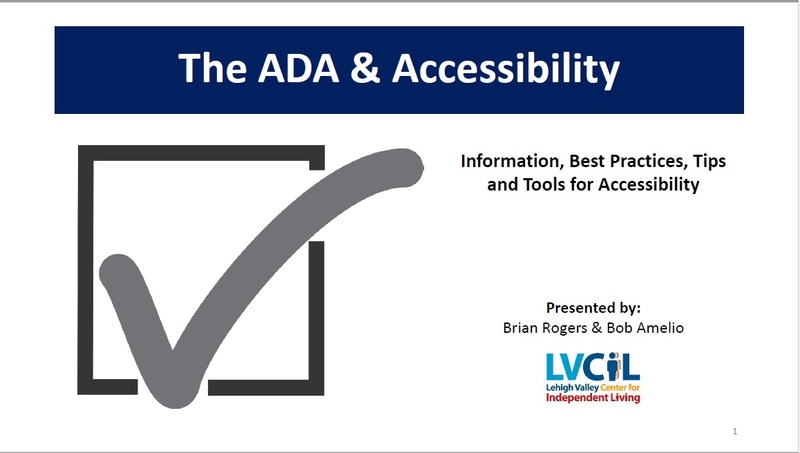 This seminar will also include an ADA checklist and training on how to perform an ADA site survey.